In this radiata pine orchard, tree breeder Harry Litchwark introduces pollen from a selected parent tree into a bag enclosing a female cone. The plastic bags prevent unwanted wind-carried pollen from fertilising the cones. 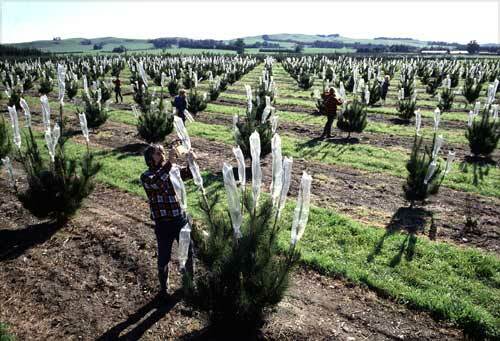 Superior strains of radiata pine have been developed in New Zealand by carefully choosing parent trees for breeding.